The Acromioclavicular Joint, or AC Joint, is one of four joints that compride the Shoulder complex. The AC Joint is formed by the junction of the lateral clavicle and the acromion process of the scapula and is a gliding, or plane style synovial joint. The AC Joint attaches the scapula to the clavicle and serves as the main articulation that suspends the upper extremity from the trunk . Allow for adjustments of the scapula (tipping and internal/external rotation) outside the initial plane of the scapula in order to follow the changing shape of the thorax as arm movement occurs. The joint allows transmission of forces from the upper extremity to the clavicle. The AC Joint capsule and ligaments surrounding the joint work together to provide stability and to keep the clavicle in contact with the acromion process of the scapula. The AC Joint has a thin capsule lined with synovium. The capsule is weak and is strengthened by capsular ligaments both inferiorly and superiorly, which in turn are reinforced through attachments from the deltoid and trapezius. Without the superior and inferior capsular ligaments, the AC Joint capsule would not be strong enough to maintain the integrity of the joint. Coracoclavicular Ligaments: Composed of the Conoid and Trapezoid ligaments (which do not actually come in contact with the joint). This combined ligament is the primary support ligament of the AC Joint. The Coracoclavicular ligaments run from the coracoid process to the underside of the clavicle, near the AC Joint. These ligaments contribute to horizontal stability, making them crucial for preventing superior dislocation of the AC Joint. Both portions also limit rotation of the scapula.The most critical role of the coracoclavicular ligament is in producing the longitudinal rotation of the clavicle necessary for full ROM during elevation of the upper extremity. 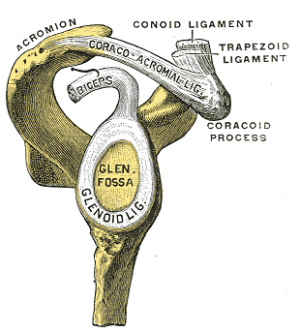 The conoid ligament is the fan shaped component of the coracoclavicular ligament. 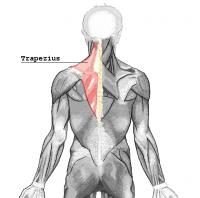 It is located more medially than the trapezoid ligament. 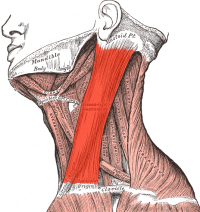 The trapezoid ligament is the more lateral portion of the coracoclavicular ligament, and is quadrilateral in shape. The acromioclavicular ligament serves to reinforce the joint capsule and serves as the primary restraint to posterior translation and posterior axial rotation at the AC joint. The disc of the AC Joint is variable in size between individuals, at various ages within an individual and between sides of the same individual. Through the 1st 2 years of age, the joint is actually a fibrocartilaginous union. With use of the upper extremity, a joint space develops at each articulating surface that may leave a meniscoid fibrocartilage remnant within the joint. Upward/Downward Rotation about an axis directed perpendicular to the scapular plane facing anteriorly and medially. Internal/External Rotation about an approximately vertical axis. Anterior/Posterior tipping or tilting about an axis directed laterally and anteriorly. The closed packed position of the AC Joint occurs when the Glenohumeral Joint is abducted to 90 degrees. The open packed position of the AC Joint is undetermined. The AC Joint is extremely susceptible to both trauma and degenerative change. This is due to its small and incongruent surfaces that result in large forces per unit area. Degenerative change is common from the 2nd decade on, with the joint space itself commonly narrowed by the 6th decade. ↑ 2.0 2.1 2.2 2.3 Levangie PK, Norkin CC. Joint Structure and Function : A Comprehensive Analysis. 4th ed. India: JAYPEE; 2006. 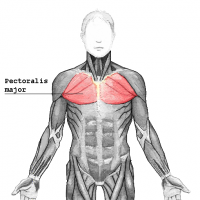 ↑ Turnbull, J.R. (1998) Acromioclavicular joint disorders. Med Sci Sports Exerc, 30, S26-32. ↑ Inman, V.T., Saudners, J.B., Abbot, L.C. (1996). 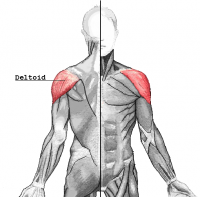 Observations of the function of the shoulder joint. 1944. Clin Orthop Relat Res. 3-12. ↑ Teece, R.M., Lunden, J.B., Lloyd, A.S., Kaiser, A.P., Cieminski, C.J., Ludewig, P.M. (2008). Three-dimensional acromioclavicular motions during elevation of the arm. J Orthop Sports Phys Ther. 38(4), 181-90.